Please view the following invitation from Bellingen Shire Council for a community event where Local Member, Melinda Pavey, will be in attendance to make an announcement that will benefit the community, businesses and tourism sector. 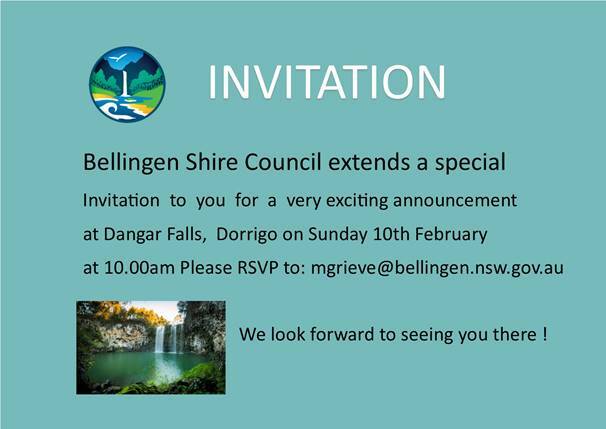 Council is inviting the Bellingen Shire community to attend an event at Dangar Falls Reserve in Dorrigo this Sunday, 10 February at 10am. Local Member, Melinda Pavey, will be in attendance to make an announcement that will benefit the community, businesses and tourism sector. We would love to see you and your family there should you be able to make it. A light morning tea will be provided by the Dorrigo Rotary Club. Feel free to pass on this invitation.